That’s what a paid internship at LifeSpeak taught Tahmina Naznen. Immigrating from Bangladesh, Tahmina arrived in Canada with a master’s in computer science and four years of experience. For six months, she struggled to secure permanent, meaningful work, losing confidence. But after a friend and fellow Career Edge alumni directed her to the program, Career Edge connected Tahmina to LifeSpeak, a Toronto-based health, well-being, and professional development organization, where she completed a paid placement as a web developer. As an intern, Tahmina worked on continuous product improvement, client onboarding and support, and CMS development. She said she learned about Canadian work culture and its software industry while developing professional communication and independence skills. She also learned to never contribute less than her best. Her astounding experience as a Career Edge intern recently ended – but not her time at LifeSpeak. She won’t continue working like a full-time employee, because she’ll continue working as a full-time employee. Rewarding Tahmina’s ‘work hard no matter what’ approach, LifeSpeak hired her permanently. Tahmina Naznen (right) pictured with her mentor Daryl Smith. Her assigned mentor, Director of Digital Operations and Infrastructure Daryl Smith, discussed his intern’s growth and value to the company. 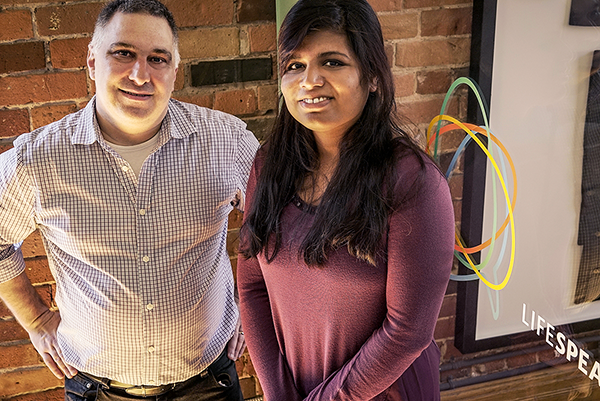 Daryl’s three-plus years of teaching at George Brown College prepared him as Tahmina’s mentor. Daryl felt proud the LifeSpeak team could contribute to Tahmina’s career launch, recognizing the importance of giving back. LifeSpeak helps organizations keep their employees present, productive, and thriving, making it easier for employees and their families to access the support they need to overcome hurdles and accomplish goals. LifeSpeak has improved the well-being of employees of many Canadian award-winning companies ­– and it’s improved Tahmina’s socioeconomic well-being. With regained confidence, and a full-time position working to help others, she recommended paid internships to other internationally qualified professionals. Tahmina described Career Edge as a “life-changer” and discussed the impact of a paid internship.